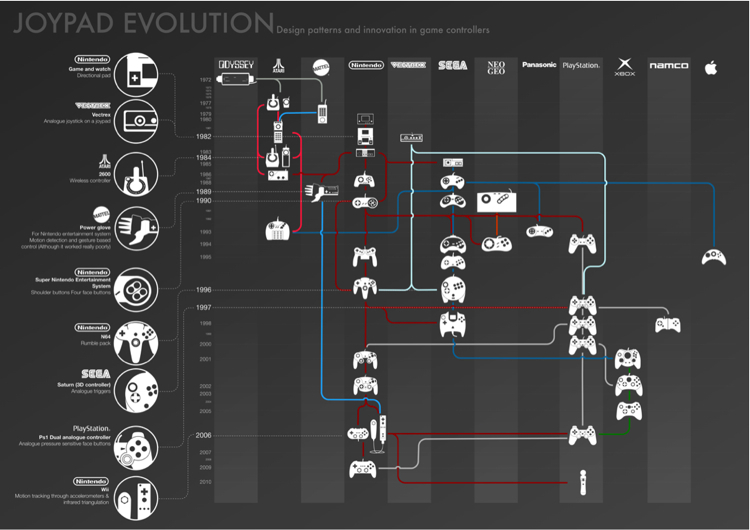 The British design agency Cxpartners has a nice little infographic showing the phylogeny of video game controllers since those prehistoric days of Odyssey and Atari. Take the Power Glove. Released for Nintendo in 1989, it was a radical departure from the controllers of the day, the first to dispatch a player’s hand gestures to the TV screen. But it was terribly imprecise; it all but guaranteed Mario would end up in some fiery pit whether you knew your way around the Mushroom Kingdom or not. So it flopped, which the chart makes pretty evident. Note that more than 15 years pass before similar technology comes out.